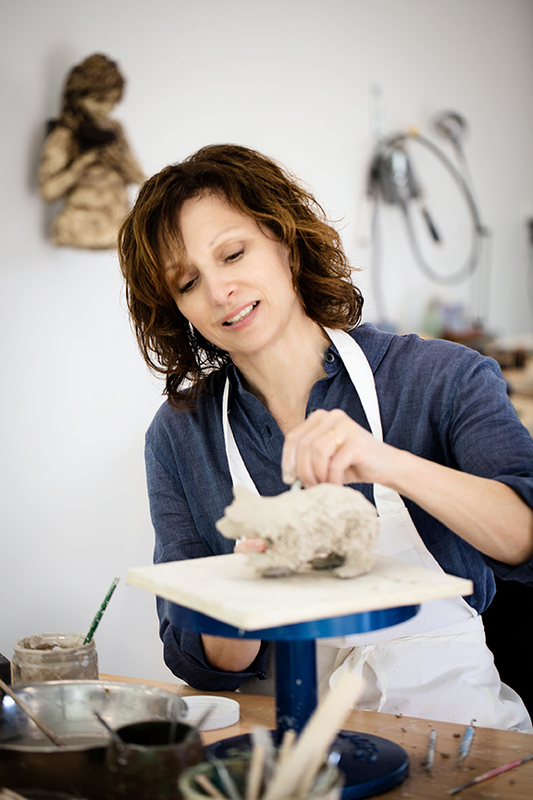 With a twist of fantasy, Lisa Hilton’s classic pieces are sculpted in clay. The sculptures in Lisa Hilton’s sun-washed studio are classically designed pieces, interwoven with unexpected additions of fantasy. 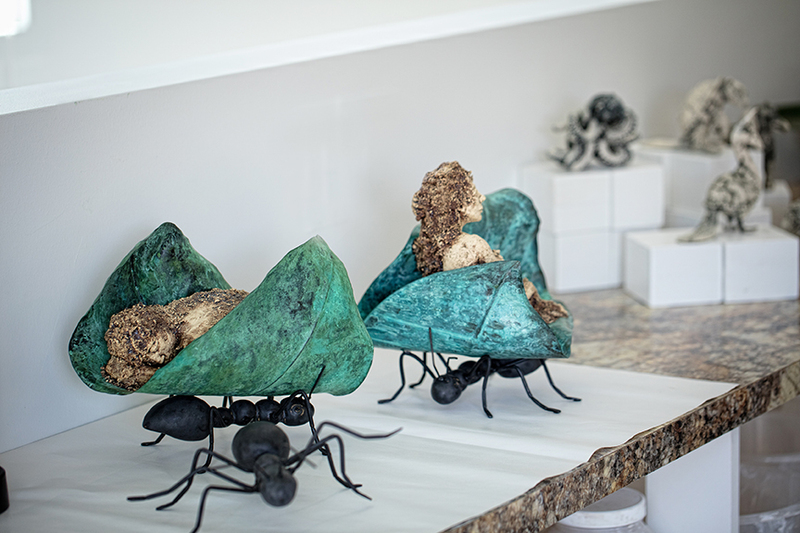 On one side, an elegant clay woman poses on a litter made from a copper leaf, carried by a giant ant. Along the wall, another female figure cradles a metal nest, her limbs resembling the lichen-covered bark of a tree. And then there are the porcelain animals in the center of Hilton’s studio and at the heart of her current sculpture series. Each of these creatures is an amalgam of animal parts, representing the personality traits of her dearest family and friends. (Hilton’s husband, a commerical real estate broker and hobbyist carpenter, is portrayed as a tenacious wolverine with an industrious beaver’s tail and a persistent turtle’s shell.) In every piece, the literal is juxtaposed with the figurative, as if an actuary embraced her artistic side. Which, as a matter of fact, is exactly what happened. Hilton, a native St. Louisan, took studio and dance classes throughout her youth. “I always loved art,” Hilton says. “I just didn’t know how to make a living doing it.” She graduated college with a Bachelors of Science in Actuarial Science and a job that paid the bills, but wasn’t personally fulfilling. She changed companies, and then careers, becoming a preschool teacher at Lucky Lane Nursery School. Finally, in 2009, Hilton answered her calling, and pursued a Bachelors of Fine Arts at Maryville University. 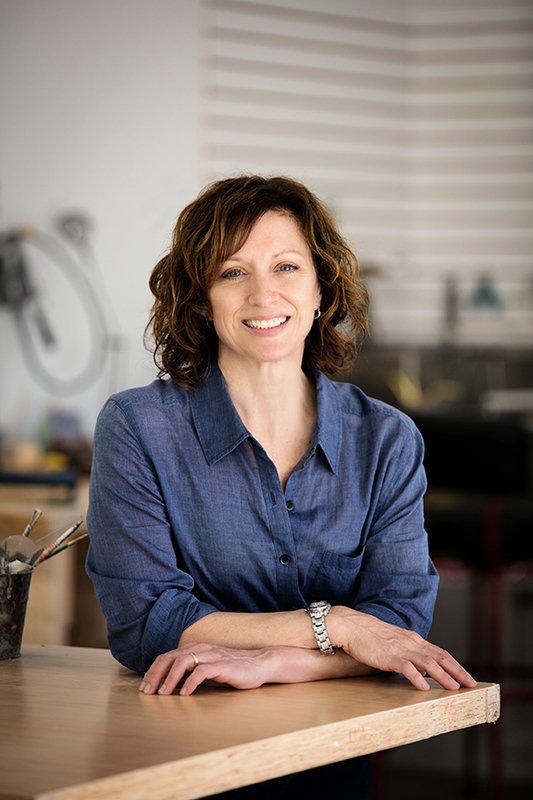 She participated in the St. Louis Art Fair Emerging Artist Program, and won the Emerging Artist Best in Show award at the 2013 art fair in Clayton. The award, and subsequent sales of her work, validated Hilton’s new path. Hilton’s creative process starts with a rough sketch of the figure. Then she shapes the clay or porcelain into individual parts. Hilton studies her face in a mirror, and, for the animal sculptures, her Shih Tzu, Sparky, to work out the details of exactly how an ear joins the head, or an eye turns at the corners. She assembles the sculpture, piece by piece, slipping and scoring wet parts together over the course of a month. And then, when the design is finished and the clay is almost dry, Hilton cuts the sculpture in half and hollows it out. “That part always freaks people out,” Hilton laughs. 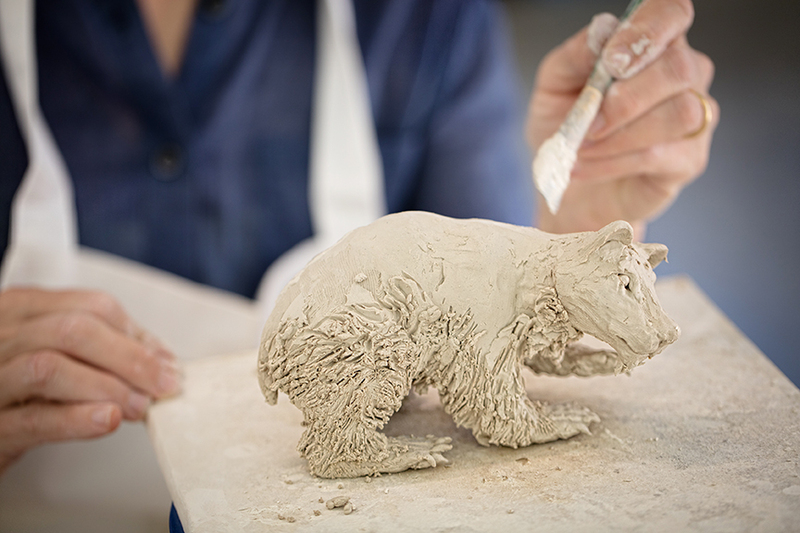 By removing the inner clay, Hilton ensures no air bubbles will expand and crack the piece when it is kiln-fired. 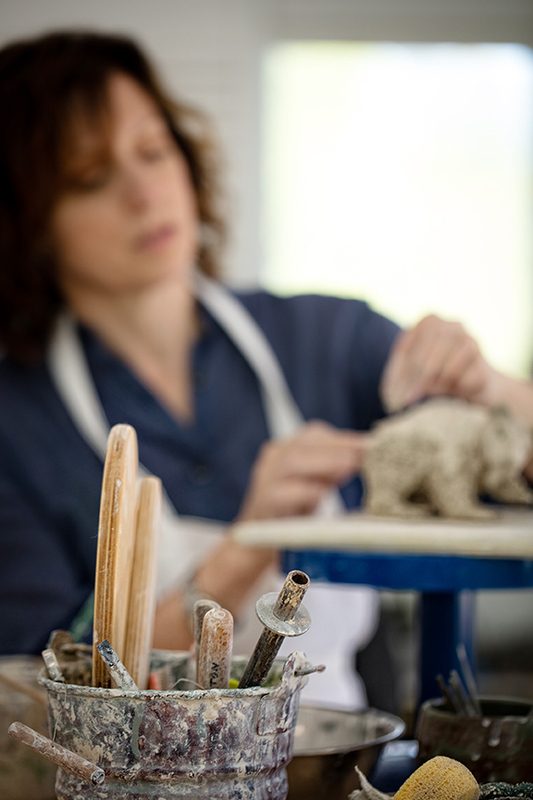 Hilton finishes her sculptures with a glaze, sometimes repeating the glaze-and-fire process two or three times until her desired finish is achieved. Because the glaze only shows its true color after it has been fired, it’s an imperfect science. But science, as Hilton well knows, is the other side of art.